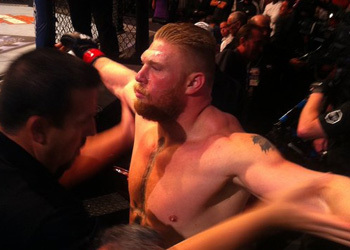 While Brock Lesnar and Junior dos Santos were busy kicking off the 13th season of “The Ultimate Fighter” last night on Spike TV, the UFC was occupied with adding another heavyweight bout to UFC 131. The TUF 13 coaches will meet in the June 11th event once filming wraps on the reality show. On Thursday, the world’s premier mixed martial arts company announced Dave “Pee-Wee” Herman and Joey Beltran have agreed to meet inside the Rogers Arena in Vancouver, Canada. Herman owns an impressive 20-2 professional record, but Beltran will mark his first fight in the big leagues. “The Mexicutioner,” on the other hand, is skating on thin ice having dropped two consecutive Octagon scraps. The pay-per-view broadcast airs live at 9PM ET/6PM PT. Lesnar and 2Santos will headline the card, with the winner advancing to challenge Cain Velasquez for his freshly minted heavyweight crown.